This is for the general information of all concerned researchers/project staff with reference to the statement 2.4 of the RDC Policy Guidelines and Procedures 2015 that a project is considered closed as soon as the final financial and technical reports are accepted by the Funding Agency. No additional monetary claim by project staff is allowed as soon as the project is closed. 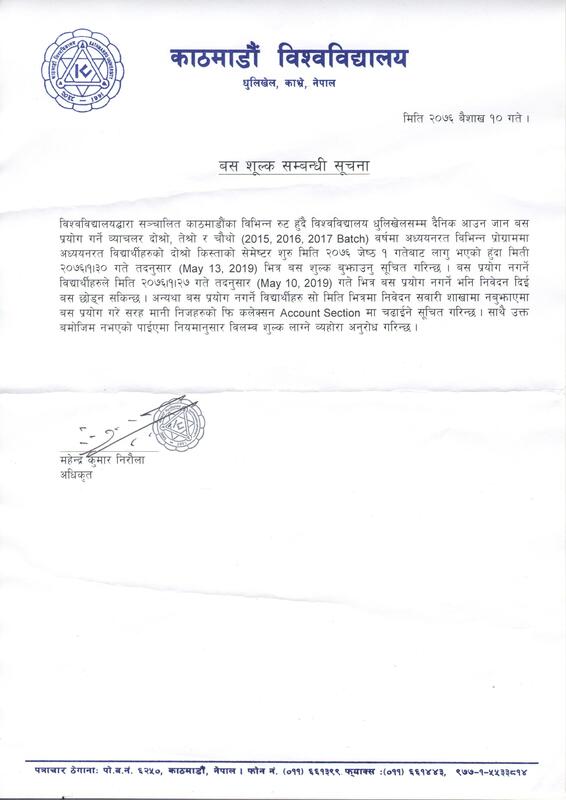 Principal Investigators of all the projects report completed on or before April 2019 are in this context informed to approach the Office of the Registrar, Directorate of Research, Development & Consultancy (RDC) based in Central Office, Dhulikhel with an application for project closing or any discrepancies before 15 May, 2019. For a list of the earlier projects undertaken, reference can be made to Archive in www.ku.edu.np/research selected on the basis of duration of five years. It will be highly appreciated if PIs would kindly submit electronic copies of the technical and financial details for the purpose of record keeping. In collaboration with German Embassy and Nepal German Academic Association Nepal, Kathmandu University is organizing a DAAD (German Academic Exchange Services) event to mark the German Day in Kathmandu University Dhulikhel on 21st April 2019. There will be an interaction program of DAAD delegates from DAAD Regional Office, New Delhi with faculties and students in KU. 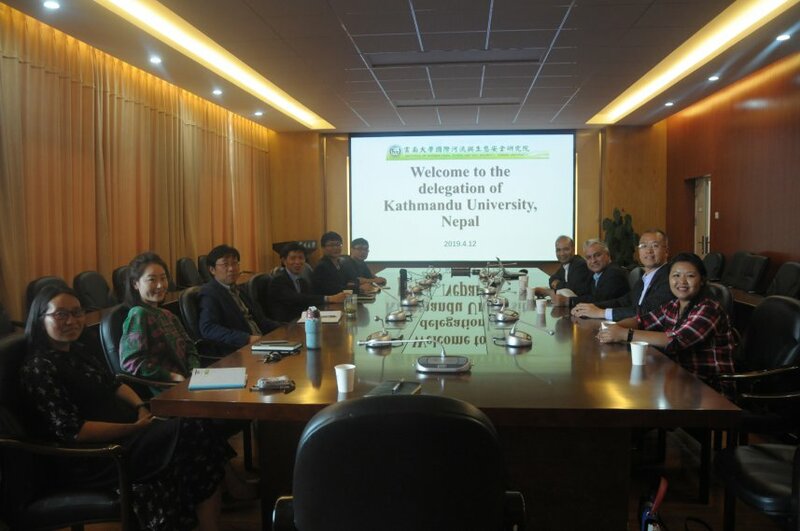 A Memorandum of Understanding was signed between Yunnan University, China and Kathmandu University on 12 April 2019 during the visit of members of Board of Trustees of Kathmandu University to Kunming, China. The scope of this MOU is related to Himalayan glaciology, hydrology, meteorology, climatology, disaster and other science and technology related fields. 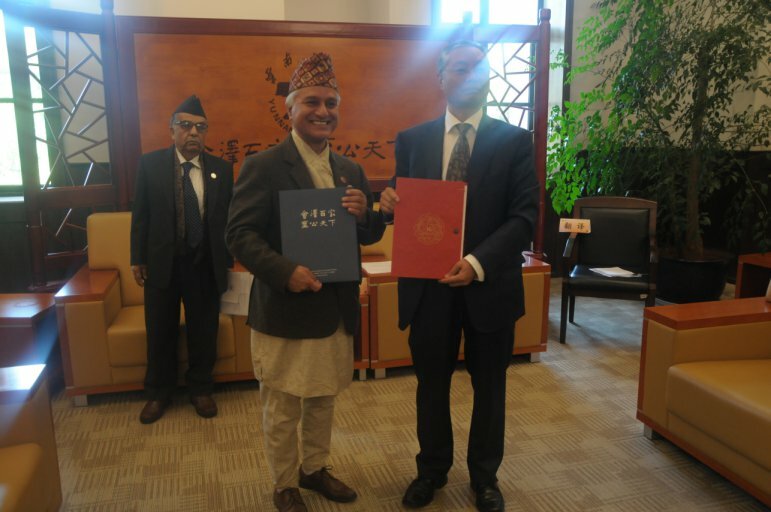 This MOU will facilitate exchange of materials and equipment for education and research, publications, scientific data and academic information; exchange of faculty, research scholars and students; joint research in both Nepal and China; and, short-term in-service and pre-service training courses. Prof. Dr. Lin Wenxun, President, Yunnan University represented his University. The team from Kathmandu University included Mr. Daman Nath Dhungana, Chairperson of Board of Trustees; Prof. Dr. Bhadra Man Tuladhar, Mr. Krishna Bahadur Manandhar, Mr. Ramesh Nath Dhungel, Members of Board of Trustees; Prof. Dr. Subodh Sharma, Registrar; Prof. Dr. Shengli Wang, Director, Confucius Institute at Kathmandu University; Dr. Kalpana Kharbuja from School of Medical Sciences; and Ms. Prateekshya Shakya from the Office of the Vice Chancellor. Associate Prof. Dr. Rijan Kayastha, Department of Environment Science and Engineering was also present at the occasion. Immediately after the MOU signing, a follow up meeting was held at the Institute of International Rivers and Eco-security, Yunnan key lab of International rivers and trans-boundary eco-security headed by the Registrar of Kathmandu University and attended by the Director and Professors of the Institute. 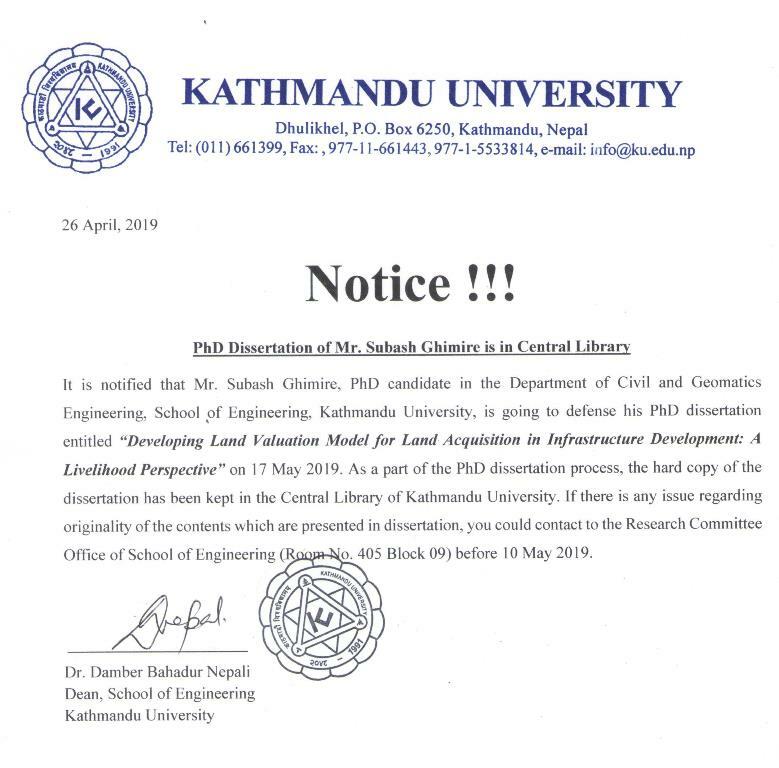 Kathmandu University, Department of Electrical and Electronics is procuring laboratory equipment for various lab at the department. In this regard, we would like to call expression of interest (EOI) from local / international companies for the supply, installing and commissioning of equipment with best available resources and technology as per attached BoQ. All the components should comply all technical specifications. Deviations will not be considered for the evaluation process. 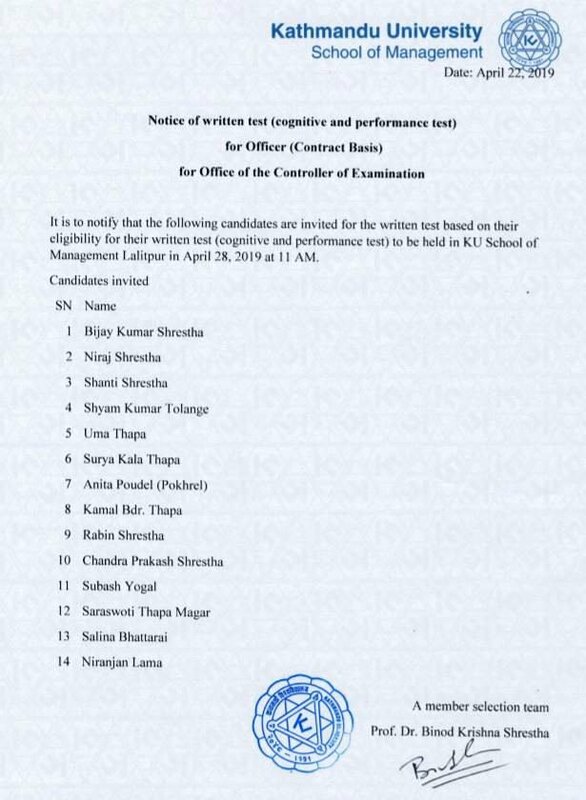 All interested applicants should submit detail technical specifications and financial proposal along with EOI to central campus Dhulikhel by 26-April-2019. Additional information may be obtained from procurement section of the university. Turbine Testing Lab organized an international symposium on “Current Research in Hydropower Technologies, CRHT” on 9th April, 2019. The symposium was followed by a training program on “Advancement in Turbine and Hydropower Technologies, ATHT-II” on 10th April, 2019. Like previous year, this event was sponsored by International Center for Hydropower, ICH. The inaugural program was conducted at CV Raman Auditorium. The event started with the welcome speech by Faculty Incharge of TTL, Dr. Biraj Singh Thapa followed by a presentation on “Recent and Ongoing activities of TTL” by Dr. Sailesh Chitrakar, the senior researcher at TTL. Mr. Tom Solberg, MD of ICH, Norway gave remarks about the activities of ICH. It was then, followed by keynote speeches from Dr. Jeong-Hwan Kim, MD of Korea Marine Equipment Research Institute, Mr. Ishwor Man Deshar, Plant Manager of Himal Power Ltd. and Mr. Kjell Repp, Chairman of the Board of Director of ICH. The session ended with remarks by Prof. Subodh Sharma, Registrar of KU. In this symposium, the technical session contained 30 presentations from four Universities, which was divided into three parallel sessions at CV Raman Auditorium, Senate Hall and Mini Auditorium. The topics of the presentations were categorized into Numerical and Experimental Techniques in Hydropower, Manufacturing Opportunities and Challenges, Hydraulic Modeling and Hydro-mechanical components, Design Optimizations, Pump technologies and Energy Systems. In the closing session, Prof. Hari Pd. Neopane provided the summary of the sessions focusing on how the diversity of the topics presented in this event justified the expansion of the symposium title from Current Research in Hydraulic Turbines to Current Research in Hydropower Technologies, starting from this year. Dr. Damber Bdr. 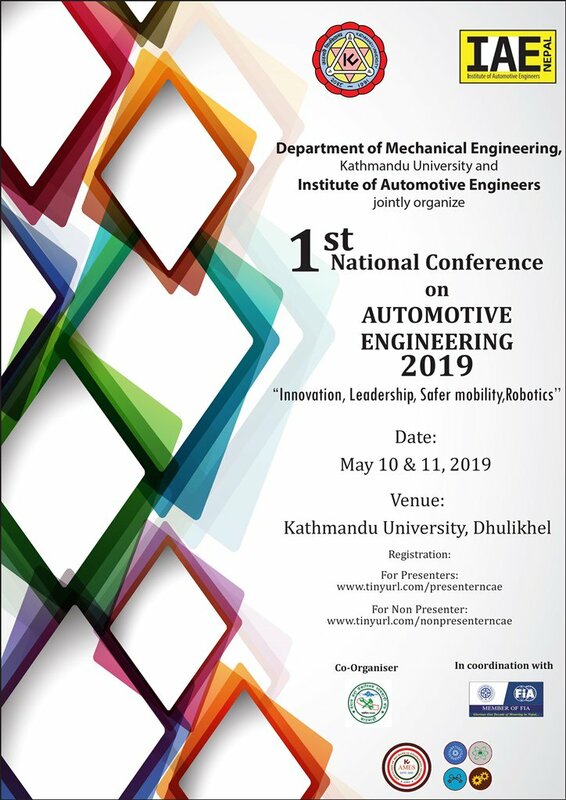 Nepali, Dean of School of Engineering finally gave the closing speech with vote of thanks to all the participants, presenters, organizers, volunteers and sponsors. The training program in the following day was focused for a closed group containing members from TTL, interested students and industrial personnel. The training was provided by experts, Mr. Kjell Repp on Water Management and Climate Change, Mr. Ishwor Man Deshar on Maintenance of Hydropower Plants and Prof. Xianwu Luo from Tsinghua University on Cavitation Vortex: Estimation and Control. Dr. Gajendra Sharma, Associate Professor at Department of Computer Science and Engineering, received Nabil Science and Technology Award provided by Nepal Academy of Science and Technology (NAST). Dr. Sharma's scientific and research contribution was in 'e-Commerce implementation in virtual worlds and their influence in real world' and 'development of effective e-Governance implementation framework for Nepal'.